You will discover the principles of conservation for different types of food, the benefits of home canning, the recommended methods as well as the ones to avoid. Then you will learn the two proper methods of treatment: the boiling water bath and the pressure canning methods. You will find a list of essential equipment and the detailed steps for a successful canning experience. Finally you will gain some hands on experience with our easy and delicious recipes. This guide do not claim to be scientific or complete. We simply wants to give you the tools you need to get into the fun activity of preparing your home preserves. Following the success of the first edition, and thanks to some suggestions from our readers, we offer this revised version, corrected and expanded. We have included the imperial and some tables on the processing time for the preservation of the most popular fruits, vegetables, meat, poultry and fish. We also cover the effect of altitude on the processing time and pressure required for the safe canning of foods. Improving on the initial contents of this document we have also redesigned it to make it more educational, more fun to read and use. Always with the aim to offer you the latest information on techniques for home canning, we opened a website dedicated to you. It includes constant updates and our latest published recipes. This site will be a valuable source of information for all. A newsletter is also available to alert you of the arrival of new information on our sites. We hope that this new revision will meet your expectations and wish you a successful canning experience and "Bon appetit"
Level 1 = easy. The recipes are very simple. You can focus on techniques for canning without too much worry about the recipe itself. 2 = medium level. The recipes are a little more elaborate. There are more steps before moving on to canning. Level 3 = complex. The recipes are longer and more complex. There are more steps before moving on to canning. By following these recipes step by step, we guarantee the success of your first home preserves. 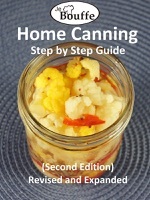 After having practiced the basic techniques you can apply them to your favorite recipes and get our book "JeBouffe Home Canning Recipes volume1" for even more idea.